Includes: 1 bottle of Optimal Repair Powder (30 servings) and 1 bottle of Optimal Protein Powder (15 servings), specific instructions, shopping list, meal plan, and delicious recipes. East West Essentials 7 Day Restorative Program includes a strategic rotation of specific foods, powered up with daily "Restorative Shakes" that enhance your body's metabolic ability to burn fat and not to store it! Our program can also give you the benefit of antioxidant-rich protection against free radical damage. It's organic fruit and vegetable powder are anti-acidic, known to relieve pain and other inflammatory issues. It goes beyond a regular weight loss program by also featuring a proprietary blend of adaptogens, which come from powerful tonic herbs that have traditionally been used for adrenal restoration to revive what has been lost due to stress and fatigue. In addition we have added our colostrum derived Optimal Protein Powder to support the body's ability to convert fat to lean muscle. The 7 day Restorative Program was developed in our clinic and recommended by leading doctors. Now, we are pleased to make it available to you. The design of our 7 Day Restorative program is to allow your adrenal system to recover, re-charge and be supported with excellent nutrition. This can balance out cortisol and other hormones excreted from your adrenals. In turn, this enhances your body's metabolic ability to burn fat and not to store it. Your body's natural metabolic function can be more efficient, thus you can more readily lose excess fat. Stress pulls nutrients from the adrenals so we have also added our Protein Powder (excellent nutrition and easy to digest) and a nutrient based food list to support your adrenals and your life! The 7 Day Restorative program heals and feeds the body at the same time. It regulates and balances the body's metabolism. This will balance pH factors helping with inflammatory issues and acidity. 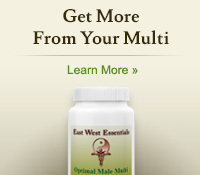 It also alleviates adrenal stress to reduce the aging process. Restoring adrenal strength, increasing antioxidants and being less acidic, are all ways to slow down the aging process and speed up weight loss. 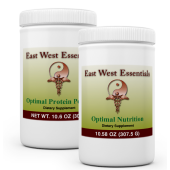 Each day you will have Restorative Shakes (a combination of East West Essentials Optimal Repair Powder and Optimal Protein Powder) along with specifically targeted foods. The program is designed for you to be having something every 3-3.5 hours (shake/food). Artificial sweetener, fillers, wheat, gluten, corn, yeast, colors, or preservatives. 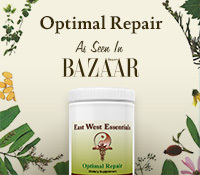 Did this program before a ten day cleanse from EWE and the results were fantastic. My skin cleared up, I lost all of my puffiness, I feel much more energetic and clear now. I'm still following the meal plan and recipes because they're so easy and delicious. 1. having the ability to restore health, strength, or a feeling of well-being. 1. something, especially a medicine or drink, that restores health, strength, or well-being. Meets the definition word for word. I feel amazing! After breaking my wrist at a kickboxing class my doctor had me on complete gym rest. What a bummer. Once I was cleared to go back I wasn't in the mood after 4 weeks of no gym time. I lost the mindset. So I tried this program to get me back into the mood of eating healthy and exercising. Losing 7 pounds gave me the motivation to get myself back to the grind. Buddy at the gym recommended this to me when I hit a plateau and stopped working out regularly. It helped me bust through that wasteland and got me back on the fat burning track. Honestly it wasn't easy for me but it was so worth it. I feel like my eating habits are changed and I have way more energy so I'm not even craving junk. Tough it out! Restorative is right! I feel so changed and new. I feel great. I hit the WORST plateau of my workout life the past couple of months. I was searching desperately for something to help me out. This did the trick! Thank you thank you thank you! This program felt like hitting the refresh button on my body. I feel cleaner, it's hard to describe. Overall I feel better and energized. I think I'll do this again in a few months. I'm not usually into supplements or diet programs but I was desperate. I was so close to my weight loss goal but felt like I peaked. I wasn't dropping any more weight no matter how hard I worked out. I thought I ate healthy and correctly but this program totally reworked my eating habits. After doing this I feel healthier, I dropped the last five pounds I wanted to, and I no longer crave junk foods. Definitely hit a reset in me somewhere and it's great. I'll do this if I ever get off track again. I've been whining and complaining about my weight for a long time. I needed something that was going to kick start my life into gear and help me take charge of those pesky pounds. This did the trick. It woke my body up and helped me actually achieve something at the gym. It keeps me going and thus keeps me motivated. Since making the decision to live a healthier lifestyle I have started going to the gym a lot. Initially the pounds just melted off and then a started to hit a plateau. I was working hard and watching what I was eating but my weight loss almost came to a complete halt. Someone who I workout with at the gym recommended that I try this 7 day program as it had worked with them. I had my reservations about trying "supplements" but decided since nothing else was changing that it was time for something new. I want to to say that listening to my friend was the best choice ever. Since completing the program and continuing my normal routine of workouts I have pushed through my plateau! In addition to breaking though my plateau I also felt much cleaner during and after my program.